Hanh Grotto. It's lying 9km west of Cam Pha City and 20km from Bai Chay. Hang Hanh Grotto is very beautiful. 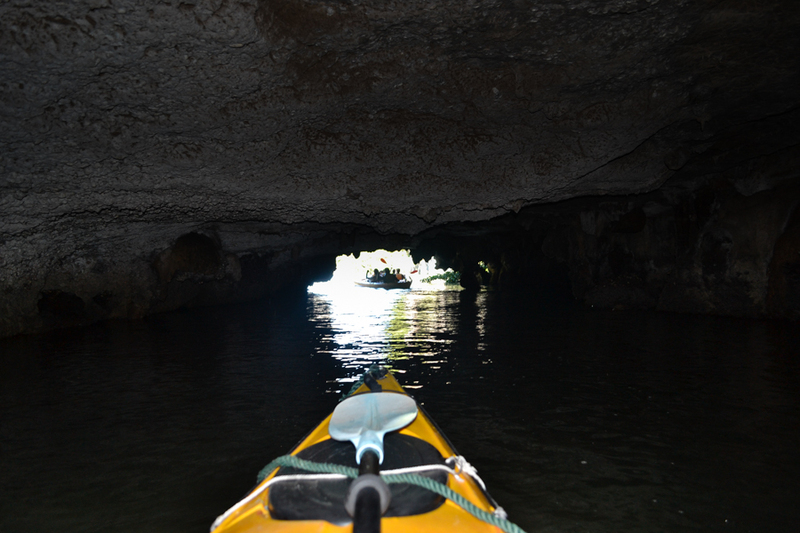 To visit this beautiful cave visitor can come here by kayak or The little boat only. It will take you throughout the stone passageway by lamp light, casting magical colors on the hanging stalactites. How Hanh Grotto is unique? 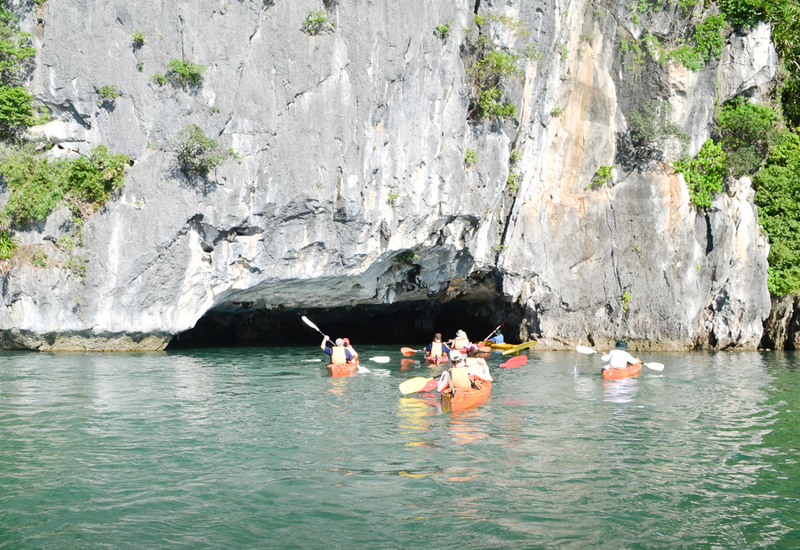 Hang Hanh is one of the longest grottoes in Ha Long Bay. It's 1, 300m long and stretches through The Stone Mountain of Quang Hanh. French calls it Le Tunnel or the Tunnel Grotto. The mouth of the grotto is indeed low one has to go by small boat to pass through. To arrive there, visitors can rent canoes at Doan Wharf or even take a bus at Cam Pha. 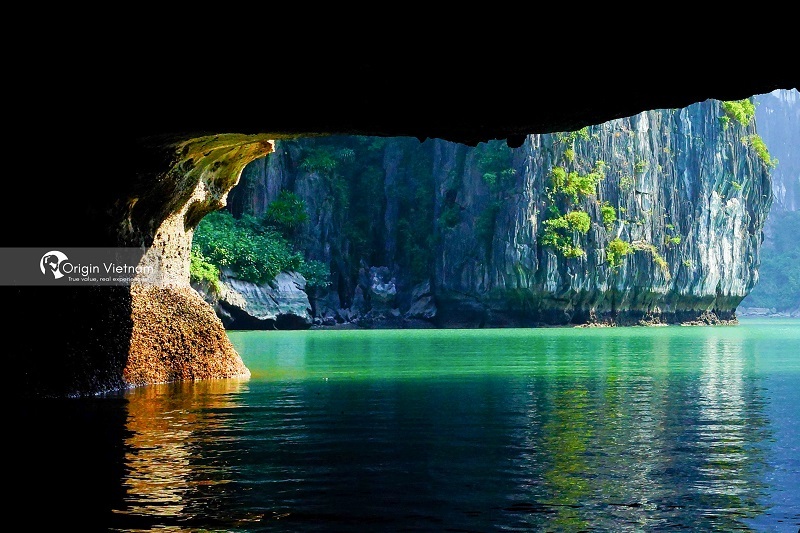 In the Cam Pha Pier, one may also rent boats or canoes to go to the grotto. One should visit the grotto at low tide, because this is the time the mouth of the grotto appears. Remember to bring along torches prior to starting the trip. It can take one some 60 to 90 minutes to complete the trip. Hang Hanh Grotto seems appropriate for adventures. Another matter of not as important is the boatmen must be experienced or else you'll get locked up in this deep Palace. In front of the present day mouth stands Ba Co shrine at a towering piece of stone. A long time ago there were three women who often moved to the sea together. One day, they caught a pouring rain and took refuge in a grotto. They found the scene so appealing that they forgot the time of the rising tide. Locked up at grotto, they passed away and become the Water God. Today fishermen generally moved to the shrine to pray for their bestowing favours on them. Together with weather, beak-taking view of the bay, the quality of the cruise is also important. As suggested by lots of travelers, those Recommended Halong Bay Overnight Cruise are good choices for tourist’s reference. Such as Dragon pearl junk.